The Trendsetter’s Fashion & Travel Sale Fair is the once-a-year show that combines your usual travel fair with a retail-shopping event in one place. This year, an even bigger and better show awaits everyone at three full halls of exhibitors and concessionaires. The Travel Sale Fair will showcase over 200 exhibitors consisting of of airlines, tour operators, recreational destinations, hotels, and resorts that are offering discounted rates and packages. The Trendsetter’s Fashion Fair will have its usual 200 plus retail shopping brands, all offering something on sale for the holiday season. 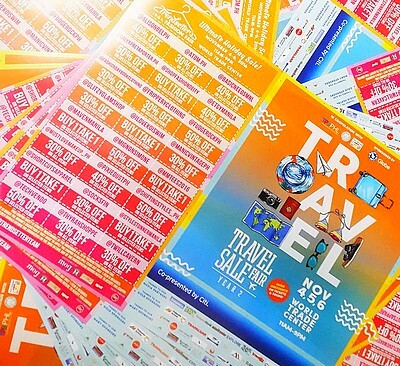 Don't miss all the exciting deals from November 4 to 6, 11 a.m. to 9 p.m., at the World Trade Center. Entrance is P100. For more information, go to the Trendsetter's Bazaar Facebook page.